Of the following expressions I A II A III B IV B which will not give compile-time errors if used as left hand sides of assignment statements in a C program? Let A be a sequence of 8 distinct integers sorted in ascending order. How many distinct pairs of sequences, B and C are there such that (i) each is sorted in ascending order, (ii) B has 5 and C has 3 elements, and (iii) the result of merging B and C gives A? There are three options for every couple. The left sub-tree of a node has a key less than or equal to its parent node's key. The right sub-tree of a node has a key greater than to its parent node's key. 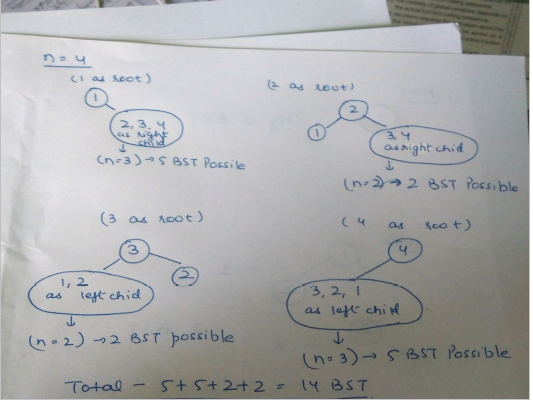 Now construction binary search trees from n distinct number- Lets for simplicity consider n distinct numbers as first n natural numbers (starting from 1) If n=1 We have only one possibility, therefore only 1 BST. If n=2 We have 2 possibilities , when smaller number is root and bigger number is the right child or second when the bigger number is root and smaller number as left child. If n=3 We have 5 possibilities. Keeping each number first as root and then arranging the remaining 2 numbers as in case of n=2. If n=4 We have 14 possibilities. Taking each number as root and arranging smaal numbers as left subtree and larger numbers as right subtree. Thus we can conclude that with n distinct numbers, if we take ‘k’ as root then all the numbers smaller than k will left subtree and numbers larger than k will be right subtree where the the right subtree and left subtree will again be constructed recursively like the root. Therefore, This solution is contributed by Parul Sharma. The given set with the concatenation operator forms a Monoid as it follows the properties of Closure, Associativity and has an identity element(null string). It is not a Group since no element has an inverse element i.e. there is no string S for another string R such that S*R = null string. Minimum: The removed vertex itself is a separate connected component. So removal of a vertex creates k-1 components. Maximum: It may be possible that the removed vertex disconnects all components. For example the removed vertex is center of a star. So removal creates n-1 components. Assuming all numbers are in 2's complement representation, which of the following numbers is divisible by 11111011? Which of the above can cause a hazard ? Case 1: Is of data dependency .this can’t be safe with single ALU so read after write. Case 2:Conditional jumps are always hazardous they create conditional dependency in pipeline. Case 3:This is write after read problem or concurrency dependency so hazardous All the three are hazardous So (D) is correct option. There are 89 questions to complete.